Join us for a presentation from EMS Freight doors October 3rd at the Landmark in Lombard. 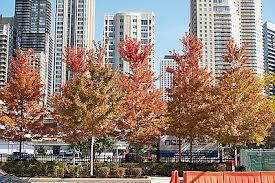 Let’s kick of the new season, “Fall” by getting together, enjoying some drinks and talking shop. Get your reservations in today. Thanks to everyone who came out for the meeting at the Trademark in Lombard on September 5th. Attendance was a packed house for this event, which made it a very enjoyable evening for all the members. We had a moment of Silence for Gary Schreiber who passed away suddenly after our annual golf outing in August. There was a presentation given by Teresa Witham Executive Director of the NAEC, and Mark Yako of GAL Manufacturing. The topic was on what the NAEC does for it’s members. Teresa’s insight on the NAEC programs CET, CAT, Spring conference, and the Fall convention, were appreciated by all the members in attendance. Everyone left this meeting with a clearer understanding of how the NAEC services its membership. There were two free trips raffled off after her presentation. Urban Elevator won the 2014 fall convention, and our newest member ECS won the 2014 spring conference. Both prizes came with full registration and Hotel accommodations for the events. Mark gave us all a great presentation on what is happening with GAL manufacturing. His knowledge of what we all should be looking for with the new codes left us all with a better understanding of what we should make sure is included in our elevator equipment. October’s meeting EMS will be presenting on their elevator freight door equipment. Mark your calendars for the next meeting on October 3rd at the Trademark in Lombard. 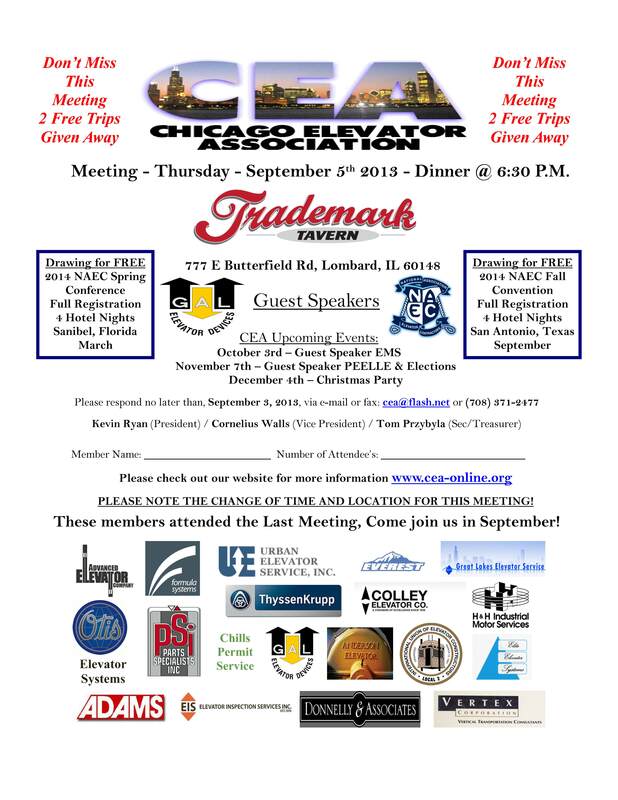 Come To The September CEA Meeting & Win Stuff! Not only will you be treated to a presentation from GAL/HW but the NAEC is going to be holding two drawings which are noted in the attachment. Both are for events they are holding in 2014. Click the .pdf link for more details. Note that Septembers meeting will be held at the Trademark Tavern in Lombard on September 5th and will include dinner. RSVP today for your chance to win.